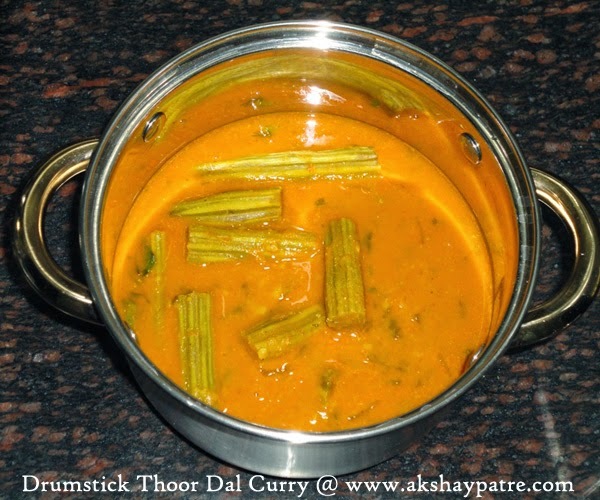 Nuggekayi togari bele saaru recipe - This is a Udupi speciality. A curry made with drumstick and toor dal is a great accompaniment for hot rice. This curry is simply adorable with the combination of coconut. This saaru is remarkably popular and my all-time favorite. 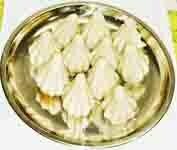 Whenever I have this saaru, I need an extra bowl of rice. I think, it is very important to mention here that drumstick is very nutritious and its popularity is because of its taste and nutritive value. Vitamin C is plentiful in drumstick. It also contains Dietary Fiber, Potassium, Magnesium and Manganese. 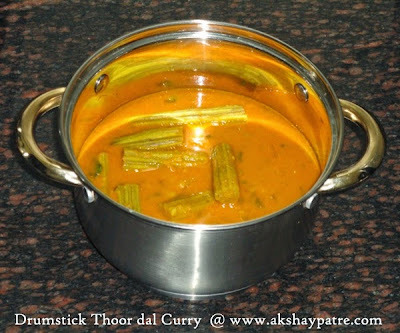 So, I am generous in adding drumsticks in curries and sambar. Wash the drumsticks thoroughly. Scrape the outer skin very lightly and cut them into lengthwise pieces. Heat the oil in a pan and add the curry leaves and onion. Saute for a while and add the drumsticks. Add 2 glasses of water and bring it to boil. Further, cook covered till the drumsticks become soft. Mix the ingredients mentioned under " Grind to Paste " together and grind to a smooth and thick paste with some water. Once the drumsticks become soft, add the cooked dal, the ground masala paste and salt. Add water if required to make the desired consistency gravy. Bring it to boil. Once the curry boils, add the chopped coriander leaves and boil it covered on low flame for 2-3 minutes. Remove from the flame and serve hot with hot rice. 1. Wash the drumsticks thoroughly. Scrape the outer skin very lightly and cut them into lengthwise pieces. Heat the oil in a pan and add the curry leaves and onion. Saute for a while and add the drumsticks. Add 2 glasses of water and bring it to boil. Further, cook covered till the drumsticks become soft. 2. Mix the ingredients mentioned under " Grind to Paste " together and grind to a smooth and thick paste with some water. Once the drumsticks become soft, add the cooked dal, the ground masala paste and salt. Add water if required to make the desired consistency gravy. 3. Bring it to boil. Once the curry boils, add the chopped coriander leaves and boil it covered on low flame for 2-3 minutes. 4. Remove from the flame and serve hot with hot rice. nice curry. Will try this.. Thanks Dear..Try and give me the feed back. Such a healthy and delicious curry.. would be great with a bowl of rice..
Tasty and healthy dal with drumsticks! !